Have you ever wondered how the private equity tycoons do it ? Would you like the chance of being involved in the next big business ? The Angel Business Club is a member’s private equity community, focussed on curating, investing in and developing businesses with outstanding potential on behalf of its members. The aim of the Club is to deliver 20% + annual growth in value in the Clubs portfolio of investments with regular financial exits. The Club invests in a broad variety of companies at different stages from seed through to pre IPO. The profit derived from the Clubs membership fees is invested in businesses and distributed free of charge to its members based on the membership levels. Believing the retail investment community to be largely disenfranchised by the established investment institutions and private equity houses, ABC has taken the concept of a Peoples Private Equity community to the next level by establishing arguably Europe's largest "Community" of Business Angels. The differentiation is not semantic; ABC believes the absence of investment management and interaction, both between fellow shareholders and their investee companies, are major weaknesses of conventional retail investment options such as crowdfunding. Having now attracted 12,000+ members, ABC is not only Introducing them to Investment opportunities they would otherwise likely never see, they are provided with a sophisticated financial eco system that not only curates, de-risks and manages their investments but also provides financial education, custodial and nominee support, peer to peer liquidity and significant inter investee company management and member communication. The ABC approach is to develop, where possible or appropriate, every investment it makes in conjunction with its community. A thorough selection process, an extremely activist investment management regime and clearly defined exit strategies have assisted in the de-risking of our member investments and the delivery of positive returns in a rewarding community driven environment. The Angel Group has created a unique and growing Investment Community in an equally unique structure, supported by a proprietary software platform (the Eco system). The Club structure facilitates any individual anywhere in the world to participate in equity investments as a non-refundable membership fee. Each month all paying members receive free shares (priced at fair value) in approved companies equivalent to their membership level minus a €10 administration fee. Given the predictable and consistent member fee cash flow, and the Club's willingness to provide growth capital or pre-IPO funding, the Club is brought significant and often pre-qualified investment opportunities by leading brokers and advisers. 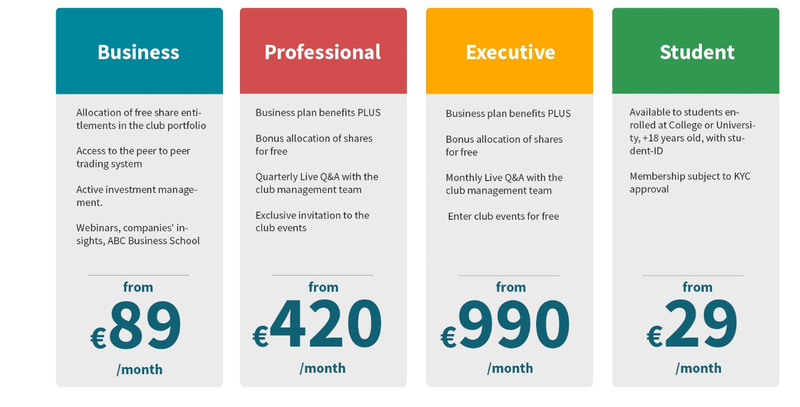 This active and important role assists the Club to deliver the member arrangements above by investing as principal and securing a discount to fair value which in addition covers the Clubs overhead. Possible opportunities for their personal investment, outside of their subscription and in a fully regulated environment through Capital Plus Partners, capable of delivering positive returns within a 3-year period. Transparency – this includes detailed information on possible opportunities. We provide regular company updates and webinars. Service – provide our Members with timely and informative customer support. Network driven success - we constantly look to and encourage our Members to exchange their knowledge on growing companies.